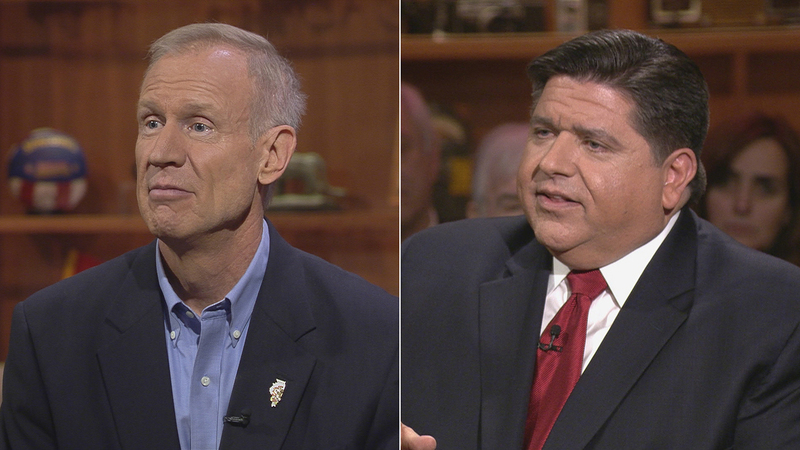 Illinois’ leading candidates for governor, Republican Gov. Bruce Rauner and Democratic nominee J.B. Pritzker, squared off in their second debate Wednesday night – this time one-on-one. Off the bat, each candidate had to tackle fresh controversies: A criminal inquiry for Rauner over his administration’s handling of a Legionnaire’s outbreak at the state veterans’ home in Quincy; for Pritkzer, the revelation earlier this week that the Cook County inspector general’s office found he’s participated in a “scheme to defraud” the assessor’s office by using false affidavits to win a property tax break. News that Illinois Attorney General Lisa Madigan has initiated a criminal probe into the Rauner administration emerged just hours before Wednesday’s debate. Madigan is a Democrat who is not running for re-election, leading Republicans to call the investigation a “desperate” and partisan attempt. “During her 16 years in office, Attorney General Lisa Madigan has done absolutely nothing to address the corruption from Speaker Mike Madigan and Illinois Democrats that has plagued our state for decades,” Illinois Republican Party Executive Director Travis Sterling said in a statement. “But now that an independent investigation has found her party’s candidate for governor to be a tax fraud, Madigan has launched a clearly partisan investigation into a serious public health crisis that Governor Rauner took swift action on and has been transparent with the General Assembly and the media. "This is nothing more than the politicization of the devastating deaths of Illinois veterans to distract from JB Pritzker’s scheme to defraud Illinois taxpayers hours before a debate,” Sterling continued. Rauner and Pritkzer will be questioned by students as part of the Mikva forum, which will air on Chicago Tonight on Monday. The two previously squared off at a WMAQ debate, where they also sparred with Libertarian nominee for governor Grayson “Kash” Jackson and Conservative Party candidate state Sen. Sam McCann.